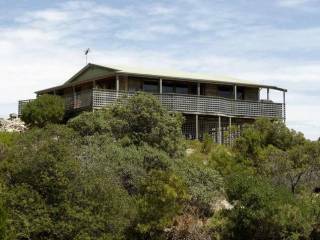 A unique island property - this secluded coastal haven offers both close proximity to pristine beaches and also the opportunity to share the natural habitat of Kangaroo Island's native birds and animals. Settled lightly on the landscape, on 40 private hectares of ancient dune country - and next door to pristine Pennington Bay - Kestrel Downs offers a beautiful vista of waterways and islands. 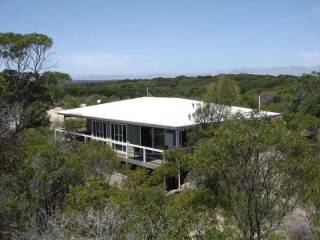 Through every window there are serene sea and bushland views. Wake to dawn's light reflected in the ocean inlet of Pelican Lagoon; sit on the verandah and watch native fauna drink and bathe at the bird bath. This island retreat features spacious open plan living with Balinese furniture, polished bamboo floors and a sparkling new farm-size kitchen. Light and airy, it offers eco-friendly design features including solar power, surround verandah and pure rainwater throughout. Go bird watching, fauna spotting, swimming, beach combing, fishing, surfing - or just relax, drift away and enjoy the view. Kestrel Downs is close to many island attractions. One of the very few properties located on the narrow isthmus of the island, it affords magnificent northern views over the ocean inlet of Pelican Lagoon and to the township of American River in the distance; and to the south, is the mighty Southern Ocean. 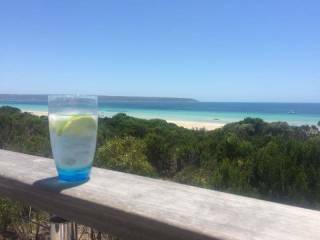 Beautiful Pennington Bay, backed by pristine dunes, is just 2km from the front door; go beach combing, fishing, swimming or surfing. Climb the 530 steps of the giant dune of Prospect Hill, adjacent to Kestrel Downs - for panoramic views of the north and south coast of the island. At low tide walk along the shores of Pelican Lagoon, located opposite the driveway. Explore the unique estuarine environment with its community of aquatic birds and schools of stingrays splashing through the shallow waters. Take a short drive to picturesque American River to eat out, sample the exquisite local oysters from the Oyster Shop, launch your boat, charter a fishing expedition or wander along the shady waterside Cannery Walk. Swim in the gentle waters of endless Island Beach, just a 10 minute drive away. Enjoy the diverse talents of Kangaroo Island's artist community at nearby Baudin Beach Gallery and Stoner's Silk and Glass Studio. Treat yourself to wine tasting and a gourmet platter at Sunset Winery or sample the delicious honey ice cream at Clifford's Honey Farm. All of this and more is at your doorstep. We do not charge for cleaning: please leave house clean and tidy. Kestrel Downs is a wildlife sensitive area and pets are not permitted. Kestrel Downs is a smoke free zone and guests are requested not to smoke inside. Please observe Arrival/Departure times - as cleaner needs access to premises between 10.00 am and 2.00 pm. Cancellation Policy: Please provide notice of cancellation or changes to your booking in writing (via email). For cancellations made more than 28 days prior to arrival, booking funds will be refunded less a 20% cancellation fee. For cancellations made more than 7 days prior to arrival, booking funds will be refunded less a 50% cancellation fee. For cancellations made less than 7 days in advance of arrival, no refund will be given, however, the reservation may be rescheduled to another equivalent period subject to availability. The ferry to Penneshaw, Kangaroo Island, departs from Cape Jervis, which is a 2 hour drive south of Adelaide, South Australia. The ferry trip takes approx 50 minutes. Kestrel Downs is a 25 minute drive from the ferry. Rex Airlines and Qantas from December 2017, have regular flights from Adelaide to Kangaroo Island. Kestrel Downs is a 25 minute drive from the airport. A map with directions and additional information will be supplied on confirmation of booking and payment of deposit.